30.04.12. Georgian president Mikheil Saakashvili hosted the Prime Minister of Lithuania Andrius Kubilius in his countryside house in Kvareli - Mikheil Saakashvili and Sandra Roelofs introduced Georgian national traditions to the guest and his wife. The guests were also familiarized with the technology of making Georgian vodka called Tchatcha, tradition of baking bread in a clay oven called tone and tasted Kakhetian wine. Lithuanian Prime Minister presented president with a special gift - the first official document which confirms support to Georgia`s territorial integrity. President and his guest spoke about the need to develop relations between Georgia and Lithuania. At the end of the visit, President Saakashvili awarded Lithuanian Prime Minister with the Order of Honor. 30.04.2012. 15th Wine & Delicacies Trade Fair Prague was held in Prague, Czech Republic. Georgian wine and alcoholic beverages companies – “Tbilvino”, “Sarajishvili”, “Shumi”, “Khareba”, ”Bagrationi”, ”Chelti”, “Wine Man” and “Besini” presented their production at large European exhibition. Georgian delegation of the Ministry of Agriculture was headed by Ia Janashia, Deputy Minister. Participating in that prestigious fair is excellent road to European wine market for Georgian companies. 25.04.2012. Zaza Gorozia, Minister of Agriculture and Jaba Ebanoidze, Head of Revenue Service of Georgia introduced joined initiative to wine and alcoholic beverages producers. Initiative infers preferential excise tax on local alcohol producing. According to the proposal, if entrepreneur - producing excisable alcoholic beverage - obtains brand spirit from local producer, excise tax will not spread on brand spirit.When preferential tax will enter into force, alcoholic beverages maker – buying locally produced brand spirit will not be obliged to pay excise tax (4.60 GEL for 1 L). A country bursting with tradition. One foot in another time and the other firmly in the present – it was hardly worth raising an eyebrow when a spanking new Mercedes passed a donkey-drawn cart on the way to the same farmers market. Bordering on Russia, Armenia, Azerbaijan and Turkey, this small country is rebuilding itself after years under Soviet rule. Here, wine is at the very heart of the vibrant cultural heritage, seeping into every bit of Georgian life. During Soviet times, Georgian wine culture was crushed to pieces under a demand of bulk wines with alcohol as the only important component. Now, the Georgian wine industry is re-creating itself and finding the old roots of quality wine production, firmly placed in indigenous grape varieties and traditional, natural winemaking methods. With an 8000-year old history, Georgia is believed to be the birthplace of wine. What is special about the traditional wine making here is the use of clay vessels called Qvevri, buried into the earth. Big enough for a person to fit in (we tried), every Georgian family still seems to have at least one. Regardless of white or red, the wines are generally made with extensive skin contact. Juice, skins and stems all go in the vessel for months until they have separated naturally and the clear wine can be drawn off. The result is quite a different wine experience – extremely tannic, almost black Saperavi or orange Rkatsiteli with flavors few European drinkers have ever tasted. With time, the wines soften, and combining them with Georgian food is almost a must. Luckily, there is no shortage of fantastic food, and the Georgians are happy to share. Georgians see any guest as a gift from God, and will treat you as such. The pride in their wine and food culture is obvious; It is also more than justified. Going to the market in the capital of Tbilisi is an experience of pure love for every foodie. No-one speaks English, communication works with a genuine smile and sign language. The stall holders are proud of their wares – from fresh vegetables and herbs to honey, dried fruits, salty cheeses, fresh walnuts and beautiful piles of spices, and are happy to let you smell and taste. For the peckish, boat-shaped bread can be bought straight out of a brick oven and dipped in golden, intensely flavored virgin sunflower seed oil. The abundance of fresh produce and meats forms the base for the traditional dinner feasts called supra. Plate after plate of khachapuri (cheese bread), coal-grilled meats, tkmali (herb and fruit sauces) and pkhali (Georgian Meze) gets carried proudly to the table and devoured in the short breaks between speeches by the tamada (toastmaster) or the guests. The toasts, which turn into a competition of the most eloquent, moving performance, end by the draining of the glass, or traditionally a cow horn. For the inexperienced, this can be a very quick path to the floor. Or to the dance-floor. Amazing live music and harmonious singing spaces the talks, and no-one will complain if you get up to shake down dinner. 23.04.2012. Russia is in interest in removing of the embargo on Georgian products more than Georgia. This was stated today at a press briefing by the Deputy Georgian Foreign Minister Nino Kalandadze, commenting the upcoming release of the Georgian lemonade "Zedazeni" on the Russian market. "Russian authorities have long wanted to involve Georgian producers to the Russian market. Decision to impose an embargo, which was designed (by the Russian authorities) to impose a political and economic pressure on Georgia was initially ineffectual. They could not harm us from both political and economic point of view", Kalandadze said according to the edition. Ban on import of Georgian wine and mineral water "Borjomi" to Russia was introduced in the spring of 2006 after the sharpening of Georgian-Russian relations. The official reason for the ban has been called the poor quality of Georgian products. Since then, Georgian wine and mineral water manufacturers are repeatedly trying to return to the issue of the resumption of supplies, but have not found political support of the leadership of the country in this matter. 25.04.2012. To celebrate 20 years of Estonian-Georgian diplomatic relations, the Georgian parliament sent, as a gift, a total of 202 bottles of Georgian wine to Estonian MPs which makes two bottles per MP, writes Postimees. Estonian MPs said that they were pleasantly surprised of the gift and that they were deeply grateful for the Georgian nation, but the gift also caused some heated debates in the Estonian parliament as to what should be done to avoid a possible media scandal over such a present. Some MPs said that the Estonian parliament was put between the rock and a hard place because such a present must be declared in order to legalize it. March 27, 2012. Georgia has completed the first stage of registration of appellations of origin of Georgian wines in the United States of America. 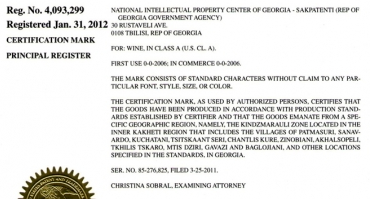 In particular, the United States Patent and trademark Office has already issued titles of protection in the name of Georgia for 12 appellations of Georgian wines. These are: “Khvanchkara”, “Kindzmarauli”, “Tsinandali”, “Akhasheni”, “Qvareli”, “Manavi”, “Teliani”, “Gurjaani”, “Kakhuri”, “Mukuzani”, “Tvishi”, “Vazisubani”. The registration process for the remaining 6 appellations will be completed in the near future. By the registration, the state of Georgia acquires an exclusive right to determine the persons authorized to use appellations of origin of Georgian wines on the territory of USA and to prohibit the facts of illegal use of appellations. In connection with these issues, the delegation of Sakpatenti, headed by its Chairman Irakli Ghvaladze, during the visit in the USA, also had a meeting at the U.S. Alcohol and Tobacco Tax and Trade Bureau (TTB). Winemaking is deeply rooted in Georgia’s history, culture and economy. The world’s first cultivated grapevines are thought to have originated in the country’s fertile valleys some 8,000 years ago. The famous 17th century French traveler Jean Chardin wrote that no other country was so rich in the diversity and quality of its wine. It is, therefore, no surprise that wine production is very important for Georgia’s economy. Many households depend on revenue derived from it and with a significant proportion of Georgia’s wines reaching foreign markets it is a key export earner. Strong competition from producers in the world’s other wine-producing countries and the need to expand market access, are fuelling efforts to modernize and improve the industry. This article examines the legal measures taken by Georgia to create a favorable policy environment to uncork the enormous economic potential of the country’s rich wine-producing heritage. Over 100,000 tons of grapes are used by non-registered private individuals to make wines for home consumption underlining the significant growth potential of Georgia’s wine sector. Georgia’s long winemaking history has given rise to unique methods of production, such as, wine made according to the “Kakhetian rule”, where it is aged and stored in a special cone-shaped clay vessel known as a kvevr. Each kvevr holds between 300 and 500 liters and is placed in the ground to help regulate storage temperature, keeping it between 14 and 15°C. Wines produced in this way are noted for their high extraction and tannic content, distinctive aroma and unique taste. These traditional production methods co-exist with more modern “European” techniques, resulting in a wide range of flavor profiles. Return of Georgian products will be resolved after inauguration of Russian President Vladimir Putin, Vzglyad cites Georgian MP Kakha Kukava as saying. Kukava is negotiating the issue with Russian Chief Sanitary Inspector Gennady Onishenko. He negotiated the problem in Moscow. Georgia has been negotiating return of Georgian products to Russia since March 2011. Georgia expected wine to return to Russia in February. Georgia increased wine exports by 37.7% in 2011, compared with 2010, earning $54.1 million. A total of 16.9 million liters of wine were sold. Georgy Apkhazava, Chairman of the Georgian Wine Association, said that Ukraine is the biggest importer of Georgian wine, followed by Kazakhstan and Belarus. Russia banned Georgian wine in 2006. Kukava said that lifting the ban would mean exports of 10 million bottles to Russia. Georgia used to export four times as many to Russia before the ban was passed. When someone asks you what country wine originated from, chances are, you're thinking somewhere in Western Europe. But in reality, the world's oldest wine producer is Georgia. Archaeological digs trace it all the way back to the Stone Age. Clay amphoras, 8,000 years of age, would be filled with grapes and buried into the ground until wine was produced. Recently, Agora hosted a dinner to help show how great Georgian wine can be. Guests tasted four wines, three of which were produced by Château Mukhrani, located in the east part of the country, which makes up 70% of total wine production. With rich soil and good climate in a largely mountainous region, Georgia is able to produce over 500 grape varieties. And Mukhrani takes it a step further with all selectively hand picked grapes in an organic environment. The result is a thoughtful, quality product. The first wine guests tasted was a 2009 Goruli Mtsvane, a golden colored, fruity, crisp, dry white. With notes of green pepper, a staple of Georgian wines, it gives way to melon flavors and minerality in the long finish. Agora paired this wine with a shellfish soup that include shrimp, scallop and mussel. The refreshing nature of this wine goes well with light seafood and could also be paired with poultry. April 9, 2012. China and the Czech Republic are priority export markets for Georgian wine, the Georgian Agriculture Ministry said on Monday. According to the report, within three days, 50 journalists from France, Lithuania, Latvia, the Czech Republic, Kazakhstan, Ukraine and China will get familiarized with Georgia as one of the major wine producers and a country with ancient culture. The Chinese and Czech markets are new for Georgian products, the report says. Therefore, assessment of editors of prestigious magazines and newspapers, as well as experts from these countries is of great importance for promoting Georgian products.